In Hong Kong, Macao, Malaysia, Brunei and other countries and regions almost all households that understand Mandarin Chinese can at least receive one or two Phoenix Satellite Television channels. There are over three million Chinese viewers who watch Phoenix TV program in Malaysia. Audiences in Indonesia, the Philippines and some other ASEAN countries are also increasing rapidly. In Singapore, both Phoenix Chinese Channel and Phoenix InfoNews Channel were entered pay television systems --- Star Hub and SingTel. In Australia, New Zealand and Japan, Phoenix Satellite Television uses a number of different formats to reach local Chinese communities, and has become one of the most widely welcomed Chinese language television broadcasters. In some countries where Chinese are not numerous local pay television operators are also beginning to hope that they can include Phoenix channels in the packages that they offer. In 2008 Phoenix Satellite Television entered cable systems and IPTV networks in Guam, the Marshall Islands, and Kyrgyzstan. Phoenix Satellite Television entered the US market in 2000 and now already has over 200,000 viewers. Chinese families in the United States not only can receive the Phoenix American Channel and InfoNews Channel through DTH services, but can also receive them on cable systems from cable operators like Time Warner, Comcast, COX, AT&T, and IPTV from KyLin TV and other platforms. Phoenix American Channel was the first foreign-based Chinese language television service to enter the Canadian market. In2008 Phoenix InfoNews Channel also successfully entered Canada. New York, Los Angeles, San Francisco, Vancouver and Toronto are the five cities in North America with the largest Chinese populations. 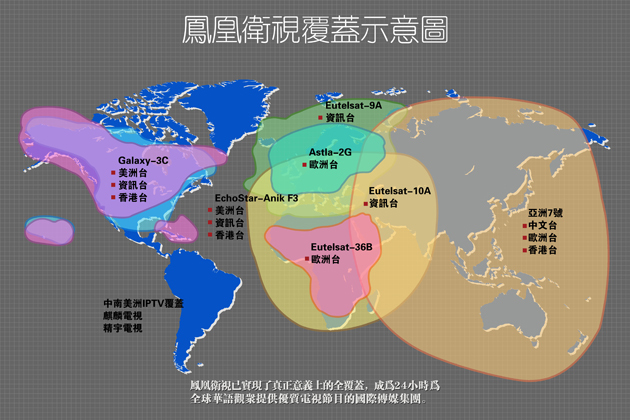 Phoenix Satellite Television is the first Chinese language television broadcaster that entered the cable systems in all five of these cities. In 2008 Phoenix Satellite Television began to enter the second tier of cities with Chinese communities and has already entered cable systems in such places as Washington, Boston and San Diego. In 2009, Phoenix InfoNews Channel and Phoenix American Channel were entered Verizon Fios TV and AT&T National Network System. AT&T is the largest telephone and telegraph company in the USA. The Phoenix North American Channel and InfoNews Channel were also through Kylin TV and ADTH, and entered some of the local cable networks to cover Central and South America. In 1999 Phoenix Satellite Television joined with the original European Oriental Satellite Television to establish the Phoenix Satellite European Channel (PCNE). After changing the satellite service, Phoenix European Channel covers over forty countries in Europe, and also entered Sky Digital which is the major satellite television network, as well as covered Morocco, Tunisia, Libya, Algeria, and other countries in North Africa. The Phoenix European Channel has entered local cable services and IPTV systems, and today can be viewed on the major cable systems in the United Kingdom, France, Holland, Germany, Spain, and Portugal. Phoenix European Channel was also the first Chinese language broadcaster to enter the European IPTV system. In 2009 Phoenix European Channel began to enter the platform of Something TV in England. The opening ceremony of the new London office of the Phoenix European Channel was held on July 26, 2012. This marks a new chapter of PCNE to serve the Chinese in Europe. In addition to the six countries in North Africa mentioned above, Phoenix European Channel was through the satellite of MIH and digital television system of StarTimes to cover most of the remaining African countries. Phoenix InfoNews Channel was at the ZTE's platform covering the whole Africa. Hence, Phoenix Satellite Television is providing a truly geographic coverage to the entire world.